Do you find yourself inclined to speak to someone who avoids eye contact and turns away as you approach? Neither does anyone else. When you and your dog are out, keep your head up and maintain a pleasant demeanor with a smile on your face. In other words, be the type of person that YOU would like to know. When you walk your dog, match your look to the type of relationships you want to attract. Take the kids along and meet other families, or dress stylishly to catch the eye of potential romantic interests. If you just want to make some like-minded friends, anything goes! People often stick to a particular dog-walking routine. Vary your routes and time of day to cast a wider net for friend possibilities. Sitting in the waiting room at the vet or groomer can be stressful for both you and Fido. Chatting with other pet parents relieves tension and may lead to friendships. Many of the most long-lasting friendships are forged in school, and that can hold true for you and your dog. Enroll in obedience training classes, where you'll meet other caring dog owners who want their pets to be polite members of the community. If nothing else, you'll end up with an extremely well-behaved pooch! Having a common interest is one of the easiest ways to spark a friendship. Check resources such as Meetup, Facebook and the American Kennel Club for dog clubs and groups in your area. Can't find one you like? Start your own! 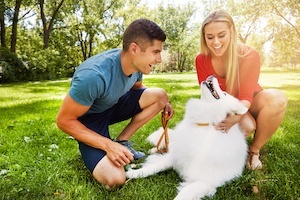 We love the four-legged members of our Springs luxury apartment communities. Our on-site leash-free dog parks are the perfect spots to spend quality time with Fido while getting to know your neighbors and their pets.